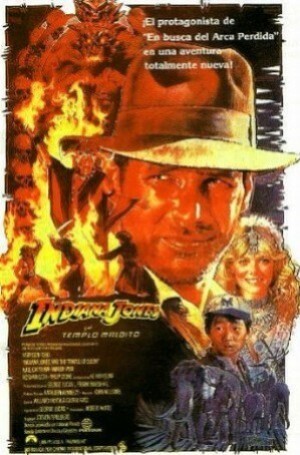 Tras una espectacular pelea en un famoso local, Indiana Jones escapa junto a una bella cantante. Tras una serie de peripecias llegan a un poblado indígena, cuyos habitantes piden ayuda a Indiana. Harrison Ford, Kate Capshaw, Jonathan Ke Quan, Amrish Puri, Roshan Seth, Philip Stone, Roy Chiao, David Yip, Ric Young, Chua Kah Joo, Rex Ngui, Philip Tann, Dan Aykroyd, Akio Mitamura, Michael Yama, D.R. Nanayakkaru, Dharmadasa Kuruppu, Stany De Silva, Ruby De Miel, D.M. Denawake, I. Serasinghe, Dharshana Panangala, Raj Singh, Frank Olegario, Ahmed El-Shenawi, Art Repola, Nizwar Karanj, Pat Roach, Moti Makan, Mellan Mitchell, Bhasker Patel, Arjun Pandher, Zia Gelani, Debbie Astell, Maureen Bacchus, Corinne Barton, Carol Bebbington, Sharon Boone, Elizabeth Burville, Marisa Campbell, Christone Cartwright, Andrea Chance, Jan Colton, Louise Dalgleish, Lorraine Doyle, Vanessa Fieldwright, Brenda Glassman, Elaine Gough, Sue Hadleigh, Sarah-Jane Hassell, Samantha Hughes, Julie Kirk, Deirdre Laird, Vicki McDonald, Nina McMahon, Julia Marstand, Gaynor Martine, Lisa Mulidore, Dawn Reddall, Rebekkah Sekyi, Clare Smalley, Lee Sprintall, Jenny Turnock, Ruth Welby. Steven Spielberg (Dirección), Douglas Slocombe (Montaje), Willard Huyck, Gloria Katz, George Lucas (Guión), John (II) Williams (Música).